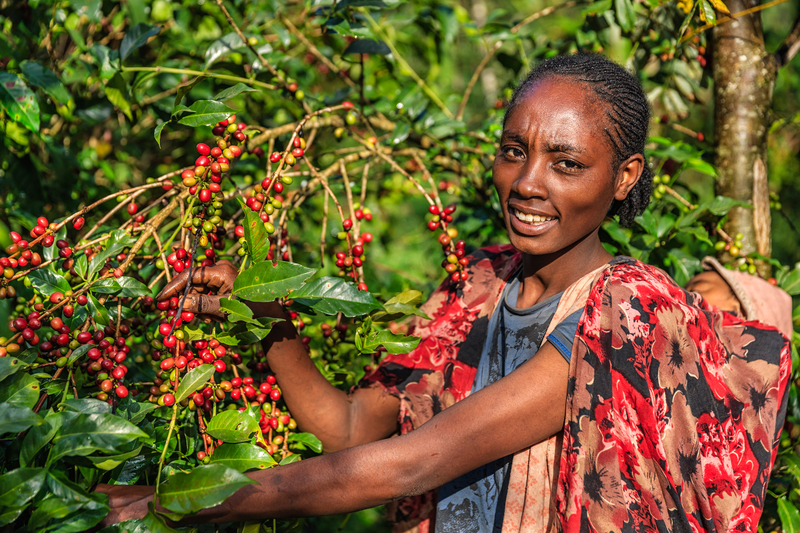 Young African woman collecting coffee berries from a coffee plant and carrying her little baby on back, Ethiopia, Africa. There are several species of Coffea – the coffee plant. The finest quality of Coffea being Arabica, which originated in the highlands of Ethiopia. Arabica represents almost 60% of the world’s coffee production. Measurement of child labor is critical for our understanding of its determinants and conditions, and for the design of social protection programs and policy. Jose Galdo (Carlton university), Ana Dammert (Carlton University) and Degnat Abebaw (Ethiopian Development Research Institute) report the findings of three survey design experiments implemented across Fairtrade coffee households in rural Ethiopia in three different agricultural seasons. The researchers find that there is substantial variation in child labor participation ranging from 45 to 76 percent emerging depending on the timing of the survey. Random allocation of the survey to either the child or a head of household proxy respondent shows the work of girls in agricultural settings is systematically underreported by proxy respondents relative to the child’s reports. Underreporting is explained by the child/proxy gender mismatch as differences in child labor reports ranges from 5 to 10 percentage points for girls when the proxy respondent is male. No reporting differences are found for boys across all seasons when the proxy respondent is male. Underreporting by the proxy respondent, relative to the child’s own report, is not observed in households with homogenous child gender distribution. On the other hand, knowledge of Fairtrade standards and the degree and scope of effective commercial links between farmers and Fairtrade cooperatives do not have a systematic differential effect on the proxy reporting of child labor. A non-technical summary of GLM|LIC Working Paper No. 43 “Child Labor Measurement in Agricultural Households: Seasonality, Proxy Respondent and Gender Information Gaps in Ethiopia” is now available free of charge here.